BY SUE ERWIN – Ocean CREST Alliance teamed up with Palm Island Resort last Friday, Feb. 5 to hold a fundraiser to benefit five ocean conservation organizations. 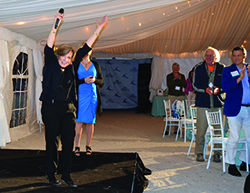 The “Your Life, Your Legacy, Adopt an MPA” banquet was held Friday at the resort on Palm Island. An “MPA” is a marine protected area that is clearly defined, dedicated and managed through legal or other effective means, to achieve long-term conservation of nature. Joseph Ierna Jr., founder and director of Ocean Crest Alliance, organized the event. Four prominent speakers gave presentations at the event. The keynote speaker was Dr. Sylvia Earle. Earle, the highly celebrated and honored oceanographer who has led more than 70 expeditions and has logged more than 6,500 hours underwater, holds numerous diving records and set the women’s depth record for solo diving at 3,300 feet. “Sylvia is probably the most important person of our times today in leading the fight for our oceans. Mote Marine’s founder, Dr. Eugenie Clark, gave Sylvia her first job, and Sylvia grew up on Florida’s west coast in Dunedin,” Ierna said. Earle spoke about the many adventures she experienced with Dr. Clark. Other speakers included Greg Jocoski from the Guy Harvey Ocean Foundation, Dr. Bob Hueter and Dr. Billy Causey. A special tribute to honor Dr. Clark was given by her son, Tak Konstantinou, and her daughter, Aya Konstantinou. “My mom never wanted to miss out on an opportunity to learn. She was always trying to inspire young people to share her love of the ocean,” Tak said. A dinner consisting of lionfish along with locally grown vegetables and other sustainable foods was served at the event. A silent auction also was held that evening. Funds raised from the event will equally support the ocean conservation organizations: Ocean CREST Alliance, Mission Blue, Guy Harvey Ocean Foundation, NOAA and Mote Marine Laboratory. For more information, visit oceancrestalliance.org.